I'm sorry for the lack of blog posts lately– last week I had a business trip in Phoenix and a personal trip to Florida for the wedding of one of my oldest friends. We got back last night. The week before that I was in Washington, DC for work. There wasn't really time to take a breath, let alone blog! Follow me on Instagram at jgrantham106! 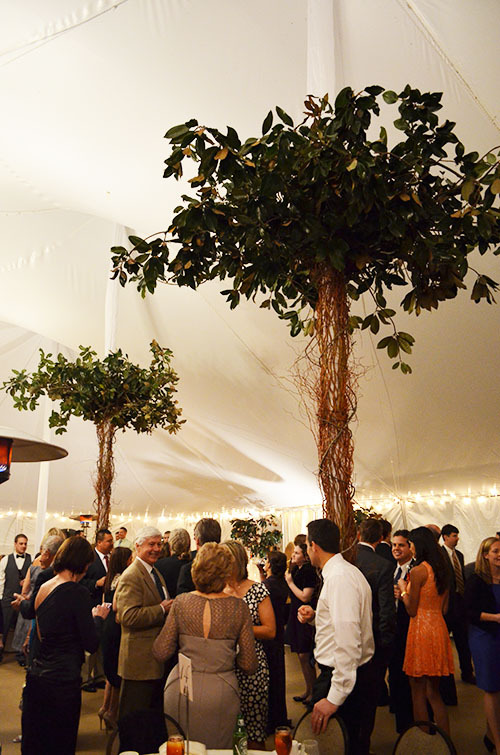 The florist transformed the poles of the tent into magnolia trees using grapevine and the branches of real magnolia trees! Isn't the effect fantastic? It's the coolest wedding element I have seen in a long time. 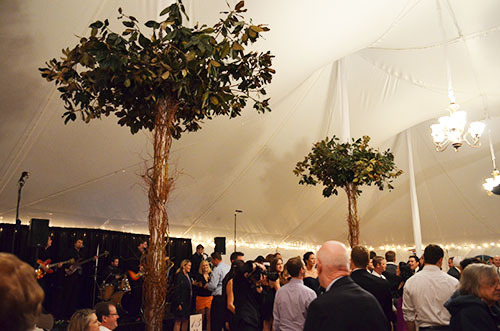 They had four trees surrounding the dance floor. 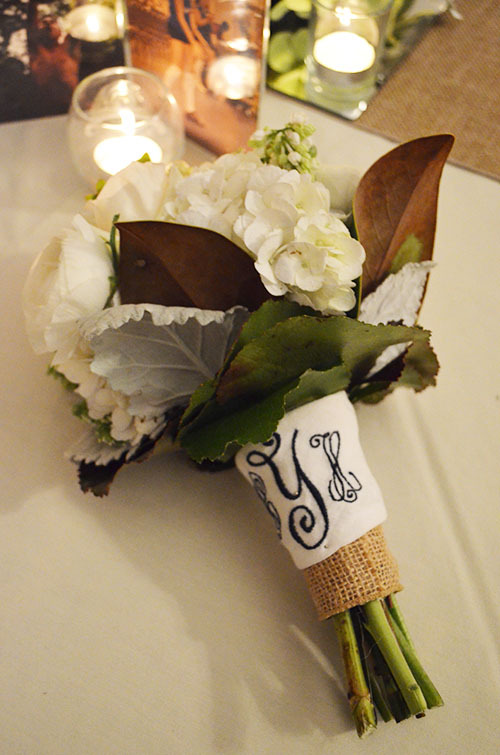 The southern theme carried into the bridesmaid bouquets, each of which were wrapped with a monogrammed handkerchief. 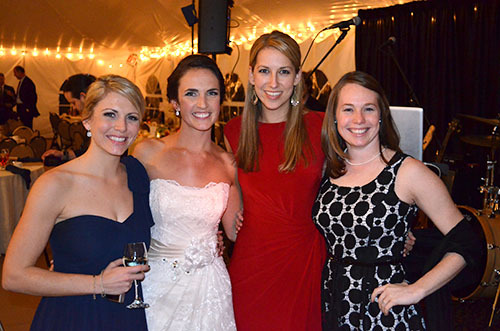 As the matron of honor said, "The only problem was that we couldn't use the hankies when we teared up!" 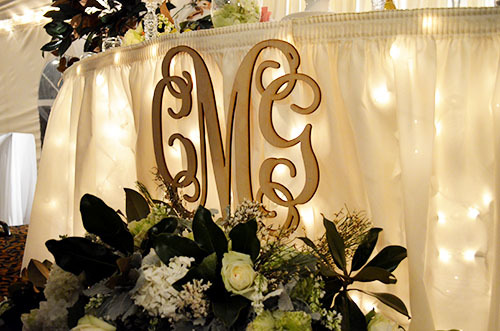 The sweetheart table had a beautiful flower arrangement and monogram, too. There were potted magnolia trees on either side of the table. 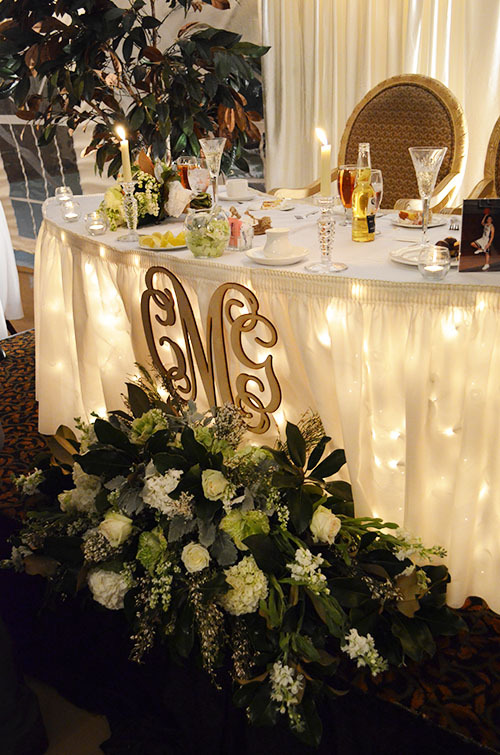 • Use pictures of the bride and groom at different ages on each table to correspond with the table numbers (bride and groom at age 7 on table 7, age 14 on table 14, etc). • Give out fun, personalized sunglasses to keep the party going late into the night. They make for great photo opps! The best part was reuniting with my best friends from childhood! I haven't lived in Florida since 8th grade, but I can pick up with these three like I just left. It's an incredible blessing to still be friends 13 years later. I hope you had a lovely weekend! I'm grateful to have a bit of downtime between road trips so I can catch up on things around the house. 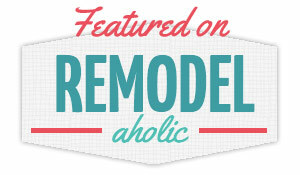 The husband has his spring break coming up, so we're working on a list of honey-do house projects I can share with you on this blog. We Accidentally Bought a Dining Table- Again!